In an era of high-scoring, pass-happy offenses, some of the Big Ten’s top teams keep it old school: Their defenses are big, stout and focus first on stopping the run. The conference has three of the top seven run defenses and four of the top 18 in the Football Bowl Subdivision. Dig deeper and six of the league’s 14 teams are in the top 50. It’s become a way of life for the 20th-ranked Spartans (3-1, 1-0). This year, they’re allowing just 40.3 yards per game and only 1.49 yards per carry — the lowest numbers in the nation by a wide margin. San Diego State is second (64.5 and 2.11). A year ago, Michigan State finished second nationally against the run and the Spartans need to continue playing well if they want to be in position of winning the Big Ten East and punching another ticket to December’s conference championship game. They host Northwestern (1-3, 1-1) on Saturday before visiting No. 11 Penn State (4-1, 1-1) and then welcoming No. 15 Michigan (4-1, 2-0) to East Lansing in two weeks. The comes a trip to Maryland (3-1, 1-0) and a home game against No. 3 Ohio State. Dantonio how challenging these next few weeks will be. And in a football climate where dual-threat quarterbacks are all the rage, stuffing the run and making teams one-dimensional has become essential. The Buckeyes (5-0, 2-0) faced a daunting test last weekend when Penn State quarterback Trace McSorley ran for a career-high 175 yards and broke the school record with 461 yards of total offense. Ohio State sealed the win, though, by tackling Miles Sanders for a 2-yard loss on a run on fourth-and-5. Now the Buckeyes face a similar challenge when Indiana (4-1, 1-1) and quarterback Peyton Ramsey visit on Saturday. The trend goes deeper than just some a couple schools. 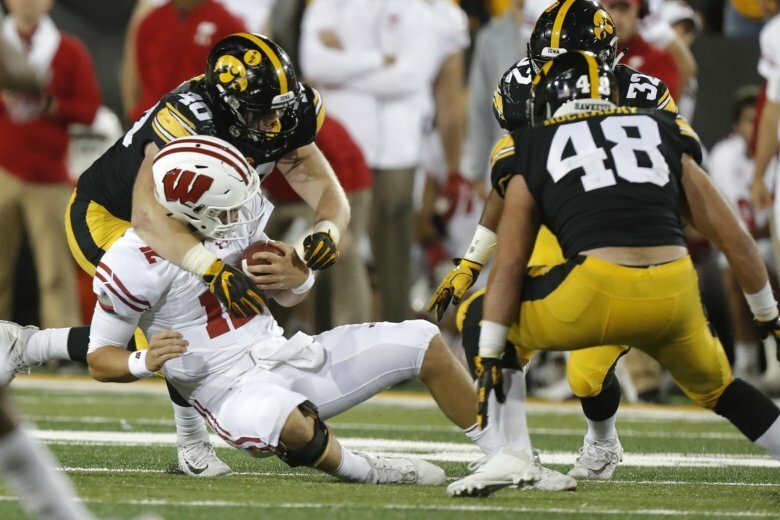 Iowa (3-1, 0-1) is No. 4 in the FBS, allowing 84.0 yards per game. The Wolverines are No. 7 (86.4). And the margin for error, as some teams learned the hard way, is small. Perhaps no team has benefited more from its improving run defense than Maryland, which heads into this weekend’s matchup at Michigan ranked No. 18 nationally at 104 yards per game. Under interim coach Mat Canada, the Terrapins could crack the Top 25 with a win in Ann Arbor. Consistency and passion — factors Dantonio has used to turn the Spartans into one of the nation’s best run defenses each year.